This is one of the most important things you are going to do as you build your worship ministry. As a leader, you will be left with this great responsibility. These waters are often murky and hard to navigate but with some core values you can pick a strong team and keep it growing. 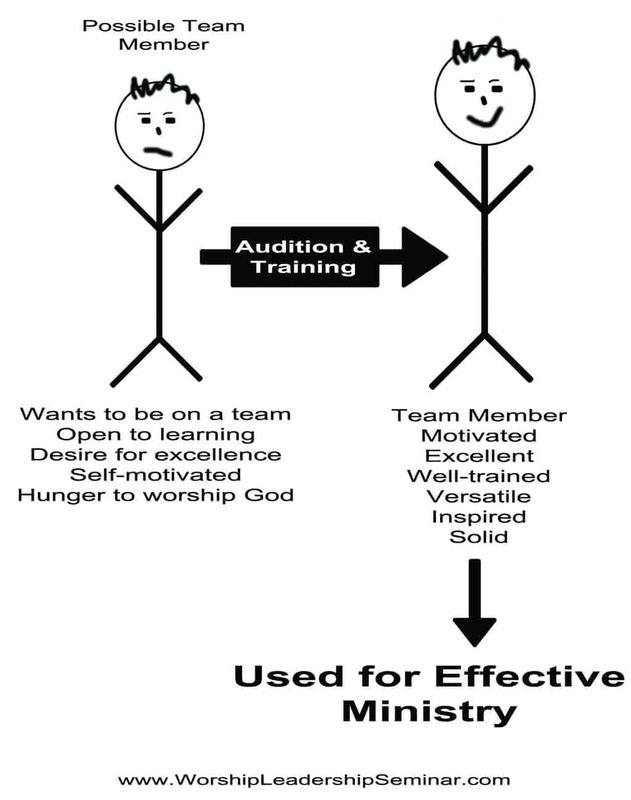 I believe that being a worship leader or a worship band member is not a right you have, it is a privilege and it is not the best place for everyone to serve. I am going to explain the type of attitude you should be looking for in the team. Above musical experience or expertise, this is the focus of building a great team. You are going to bring them into the team and develop their skills and talents! If your team individuals do not have these important core values, your team will fail. It will not be their fault though. It will be because you failed to build them into the team and choose people with the ability to learn and grow into a strong team. It is very important to get these things correct on the ground level because there are so many problems that can and will arise in a church music program. A solid audition process with clear communication is a must, but the foundation for the type of members you will use is more important. If you take my graph or bullets and pick people with the opposite characteristics, you will be setting you and your entire band up for a disaster. A disaster in the worship ministry can have very negative effects on the whole church and the people who are attending. In other words, if you want to be a happy person and lead a successful ministry in any church, you have to pick the right kind of people. Aside from musical talent, your team must be strong. I will talk more about auditions, musical training and how to select musicians in future articles. For now, take some time and evaluate your team and the way you are picking people for the team.